We ask questions. We listen intently. We consider what it is and where it came from and how and where it will be displayed. Then creativity, curiosity and years of experience guide our suggestions. Or you can poke around the shop and find what makes you smile. It’s a process that can happen quickly (Eureka!) or may take time. There’s never any pressure in our comfortable, eclectic and ever-changing gallery. Grab a seat and – let’s talk! Preservation and presentation are the goals. With style. At a price that won’t leave you dining on Ramen for a month. “Buy local” isn’t just a catch phrase. We’re not looking to franchise. We know our neighbors. This is our home. Like you, we do what we can to support businesses, schools and charitable organizations. Most of our work comes from repeat customers. We’d love to show you why. Chances are you expect quality framing at a fair price. We deliver that. But what about inspiration? Do you expect to discover framing options that elevate the work, honors the artist and delights its owners and viewers? 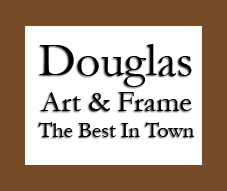 We deliver that – and more – at the one and only Douglas Art & Frame.